Every now and then a dress comes along that's so magical, it just makes you say, "Ooh La La!" That's definitely the case with this new Hi Lo Chloe dress dress from Ooh La La Couture. 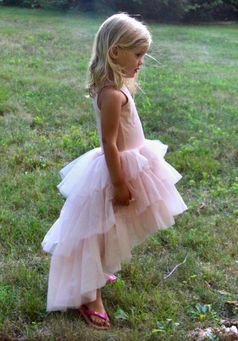 With a stylish high-low hemline on the graduated, layered skirt of heavenly pink netted tulle, your little girl will feel like a true princess in this gorgeous ball-gown. What is more - the front of the bodice is covered with an array of sparkly Swarovski crystals. The back of this stunner is racer style and is made with soft cotton knit for comfort. Fabric content is 60% cotton and 40% polyester. Hand wash cold water.